Another grand adventure for the Cornelius family. Knowing two of my passions are photography and history my husband knocked it out of the park for Mother's Day. 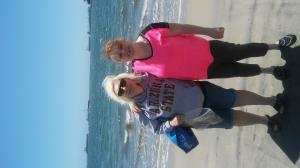 That Saturday we started our adventure by picking up my special needs Daughter, Ashley, and headed to the beach. It has been my dream to take her back to the ocean ever since we visited St Augustine in 2004. Ashley doesn't fly so I never dreamed I would be able to get her back to the beach but since moving her here to California last year that dream is so much closer. It is true that the simple pleasures in life are the best. Colleen Cornelius... Photographer and adventurer. While growing up I loved the attic. I lived in an extremely old home built in the late 1800's. While very creepy I found an amazing number of treasures hidden in this room. Even though I was frightened by what could be lurking in the dark, the lure of these treasures kept me returning even after being spooked. I think it was the start of my adventuresome spirit and the deep seeded need to explore no matter how scary something maybe. As an adult I remember distinctly the unnerving feeling I had as I carefully made my way ever deeper into the room. But soon I discovered that if I went in far enough I would be greeted by brilliant beams of sunlight cast into the darkness by the lone tiny attic window. On one particularly cold day as the dust sparkled in the ray of light like glitter I discovered a butterfly that had escaped the winter chill. Beauty in the darkness... celebrated and remembered in my shop name Butterfly In The Attic . Photographing the Rust, Dust and Nature found throughout the United States captures my adventures. I fell in love with Americana at an early age. Collections of vintage photographs and postcards created a desire to find my own moments in time and preserve them. Photographs stop time, captures the moments, and transcends the ages. Find an old photograph and imagine yourself at that moment; where were you? what were you doing? How did you get there? Most of life's best experiences happen, not when you get there, but along the way. I hope you visit my gallery and collect some moments in time for yourself.